The housing market in Ecuador, frequently touted as one of the best and cheapest countries worldwide for retirees, has been supercharged for the last five years, with home prices appreciating annually by 10 to 12 percent, Mr. Morrill said. 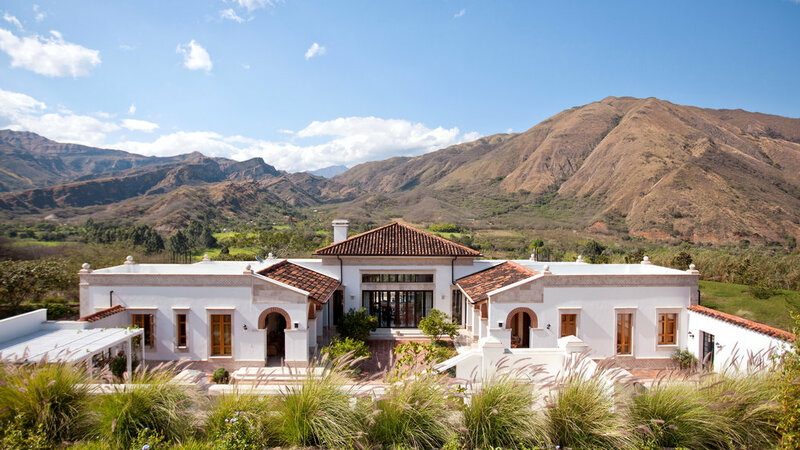 This Southern European-style mansion with Mediterranean touches was built in 2008 on more than 16 acres in a gated community near Vilcabamba, a village in southern Ecuador. The 4,400-square-foot main home, which has two spacious bedrooms and three bathrooms, is a solid rammed-earth structure with massive marble-faced walls and reclaimed roof tiles. The property was excavated and the home set low in a lush river valley for privacy. There is also a 2,600-square-foot adobe-and-stone guesthouse with three bedrooms on the property, as well as several other outbuildings. The principal home has a cavernous living room, opening to a 4,400-square-foot pool courtyard and flanked by two wings, each with a wide veranda. All ceiling heights are at least 11 feet; oversize windows are handcrafted of hardwood with internal shutters; floors are of teak or polished marble. The 900-square-foot living room has a domed ceiling and a large rough-hewed marble wood-burning fireplace. Appliances and larger furniture pieces, including antiques from England, are included in the home’s asking price, said Bernard Uhe, an owner of Huilco Real Estate, one of the companies listing the property. Sign up for weekly updates on residential real estate news from The Times. One wing of the mansion has the oversize master bedroom with private sitting room, en-suite bathroom and walk-in closet; the other has the kitchen, second bedroom, en-suite bathroom, powder room and laundry. The kitchen has high-end appliances and polished concrete countertops, along with furniture in lieu of kitchen cabinetry. A central music system and purified drinking water are among the amenities. The pool courtyard has a 65-foot lap pool and a marble staircase leading to a spacious terrace on retaining walls with 360-degree views of the valley of the Vilcabamba River. The guesthouse has two bedrooms with en-suite bathrooms, a spare room, a large kitchen and a covered patio with an outdoor fireplace, polished concrete seating and a bathroom. Outbuildings include an office, two-car garage, workshop and storage buildings. The property, on a plateau overlooking the valley with views of Mandango mountain and Podocarpus National Park, has been landscaped and planted with flowering plants and fruit orchards. The estate is in a gated community called San Joaquín about three miles from Vilcabamba, a village of about 2,000 residents, many of them foreigners, said David Morrill, a partner with Cuenca Real Estate, which also has the listing. While Vilcabamba offers some basic shopping and many restaurants, the nearest city is Loja, with about 180,000 residents, which is a 40-minute drive, Mr. Uhe said. The closest international airport is in Guayaquil, a six-hour drive or a 50-minute flight from Loja. Daily flights, about 55 minutes, are also available from Quito’s international airport, he said. The bulk of foreign retirees favor Cuenca, a city of about 330,000 in southern Ecuador, but some small villages like Vilcabamba as well as Cotacachi, which is in northern Ecuador, are also popular, as are areas on the Pacific Coast, in particular from Manta to Canoa, said Mathieu Charles Guillory of Colonial Ecuador, a Quito-based property consultancy for expatriates. Condominiums in northern Quito sell for about $186 per square foot, he said. Cuenca is less expensive, at $112 to $121 a square foot, Mr. Morrill said. In Vilcabamba, where this home is, the housing market has slowed down in the past two to three years and prices have leveled off, Mr. Uhe said. Vilcabamba has no condos, and most foreign home buyers either purchase a home in a gated community or buy land and build a home, he said. Homes in gated communities are typically $200,000 or more, Mr. Uhe said. Land usually costs about $12,000 to $60,000 an acre in the towns, or about $400 to $4,000 an acre in the countryside, while the cost of construction to the standards sought by foreign buyers is about $50 to $70 a square foot, he said. Foreign home buyers in Ecuador are predominantly North Americans, though there are also Europeans, Australians and New Zealanders, agents said. There is a significant German expatriate community in Cuenca. Most recently, many Canadians have been in the market seeking homes in the coastal areas, Mr. Guillory said. There are no restrictions on foreign home buyers in Ecuador. Bank mortgages are extremely difficult to obtain, and while some of the larger property developers offer short-term financing, it’s largely a cash market, brokers said. “I tell people if you have to finance, don’t even come down,” Mr. Uhe said.